As part of the National Landcare Program Wheatbelt NRM has been set the task of urgently acting to protect the threatened species - Matchstick Banksia, Banksia cuneata, also known as the Quairading Banksia. This is a unique species named for its distinctive flowers, is found in small patches in the shires of Quairading, Brookton, Cuballing and Narrogin. It is estimated that there are as few as 500 plants left in the wild. Banksia cuneata is listed as Declared Rare Flora under the WA Wildlife Conservation Act and as Endangered under the EPBC Act. The Matchstick Banksia is one of the 30 plants that the Australian Government has prioritised under the Threatened Species Strategy. This strategy aims to improve the future of 30 threatened plant species by 2020 and to insure all known threatened plants against extinction by 2020. 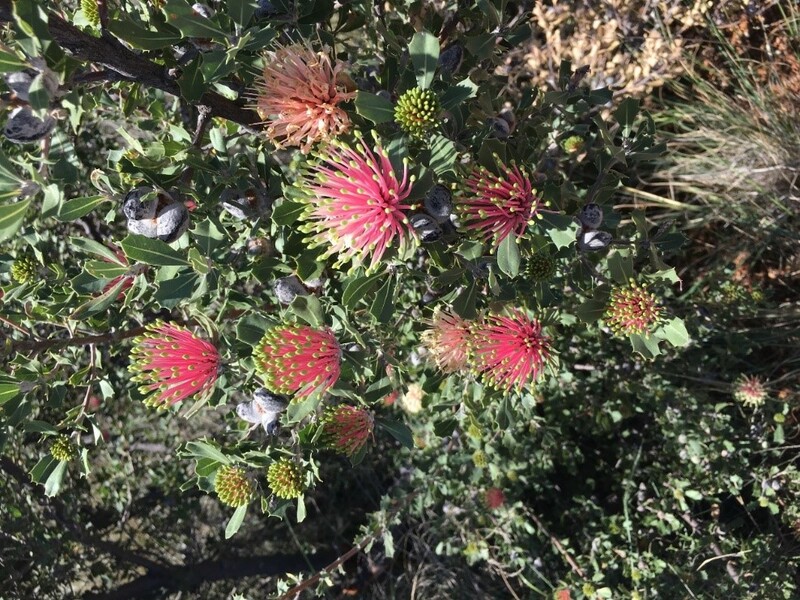 The Matchstick Banksia is a unique plant, endemic to the Avon River Basin, named for its distinctive bright pink, cream and yellow flowers tipped in green. It can be seen flowering from September to December. It is an erect shrub or small tree with smooth grey bark that grows to 2-5m tall, has dull green leaves covered in course hairs with 1 to 5 prominent teeth on each edge, with seed capsules around 2cm long and 1cm wide that are covered in matted, grey hairs forming a mottled look. It prefers grey, yellow or yellow-brown sands and is often found growing with the Acorn Banksia, Banksia prionotes, and the Sandplain Woody Pear, Xylomelum angustifolium. This species is found in scattered locations in the shires of Quairading, Brookton, Cuballing and Narrogin. Land clearing has reduced the distribution of the Matchstick Banksia to 7% of its original occurrence, with only about 500 plants left in the wild. The full extent of the populations and their distribution is unknown so the identification of additional populations is a key activity for this project. If you have seen this plant, we’d like to hear from you. Please note the Matchstick Banksia is highly prone to the effects of Dieback (Phytophthora cinnamomi) so all precautions should be made to clean and sterilise boots and vehicles when approaching this species. The aim of this project is to conserve the existing populations and to improve the overall species security. We’ll be working to achieve this through undertaking actions in partnership with land managers to tackle threats impacting on populations. The Matchstick Banksia is a unique species, both for its floral display and specific distribution within the wheatbelt region. It is featured on the Shire of Quairading logo which is where the first specimen of the species was collected and described. By forming meaningful partnerships with land managers and increasing the awareness of this species within the community we can put this species on a path to recovery. Our first step is to identify existing populations of the Matchstick Banksia as well as potential areas of suitable habitat. If you have seen this unique and distinctive plant, or are located in the listed Shires and have areas in your shrub land with grey, yellow or yellow/brown sands, we would like to hear from you! Please contact Anika Dent at adent@wheatbeltnrm.org.au or on 9670 3104 to have a chat.